So after collectively not getting around to arranging anything the original Mont Blanc to Molini trip turned into a slightly more manageable ten-day road trip taking in three different centres. 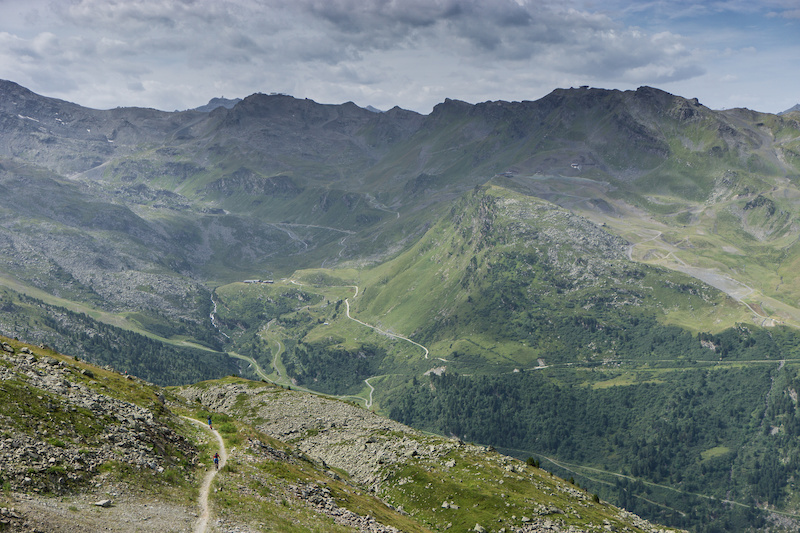 Courcheval, Briancon and the stunning Valle Maira. 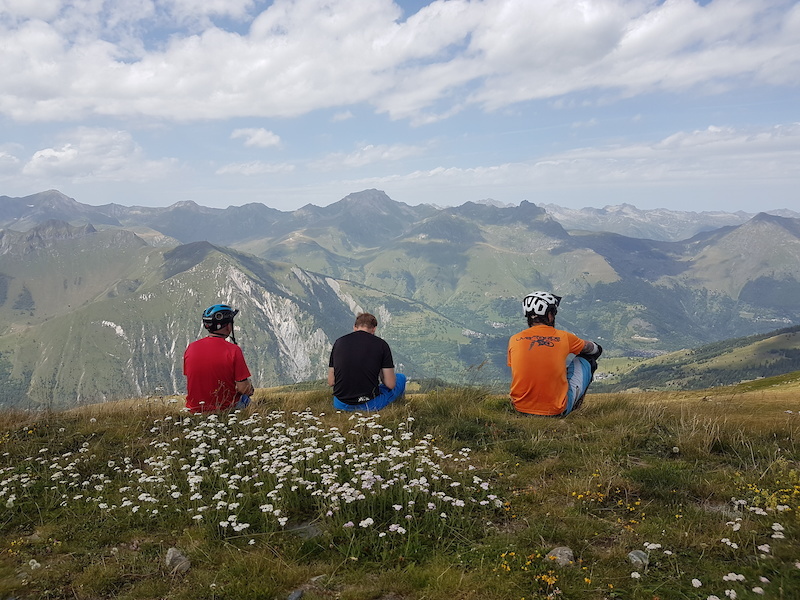 Flight times weren't great and after some glitches, we arrived at Pleisure Holidays, Drop Inn quite late in the evening, got the bikes built, had some food and turned in for a good nights sleep ready for the next days riding. After breakfast, we got our act together and jumped on the lift up Courcheval. 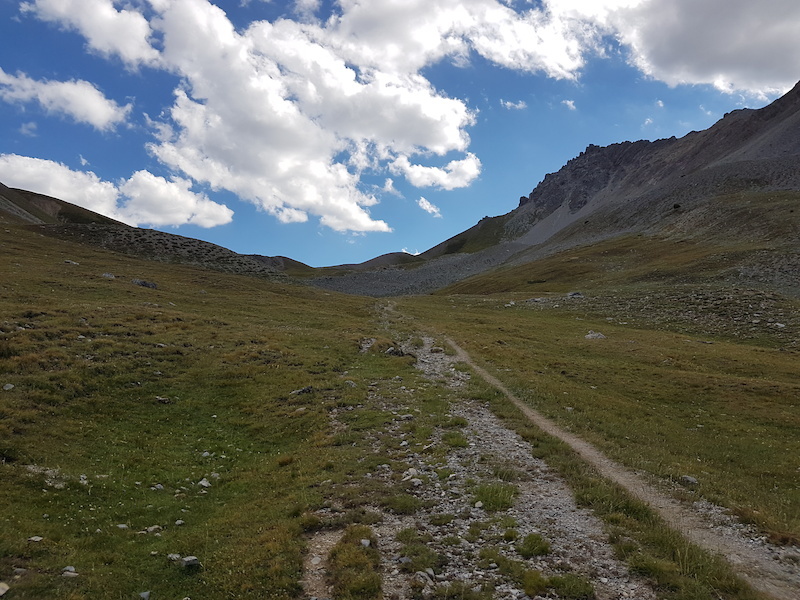 I remembered from the inaugural Trans Savoie that the Meribel ridge line down to Brides Les Bains was a cracker and was keen to repeat the route in a somewhat more relaxed manner. 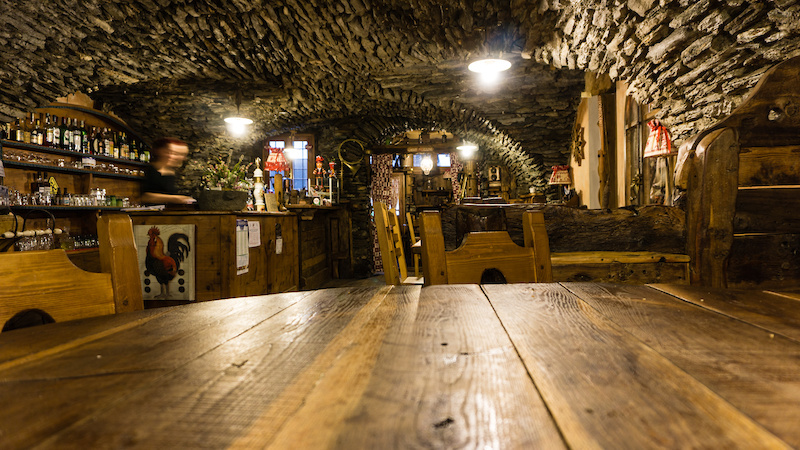 It didn't fail to deliver and after only one slight detour at the end, we found ourselves back at Brides just as the bus up to Meribel arrived. 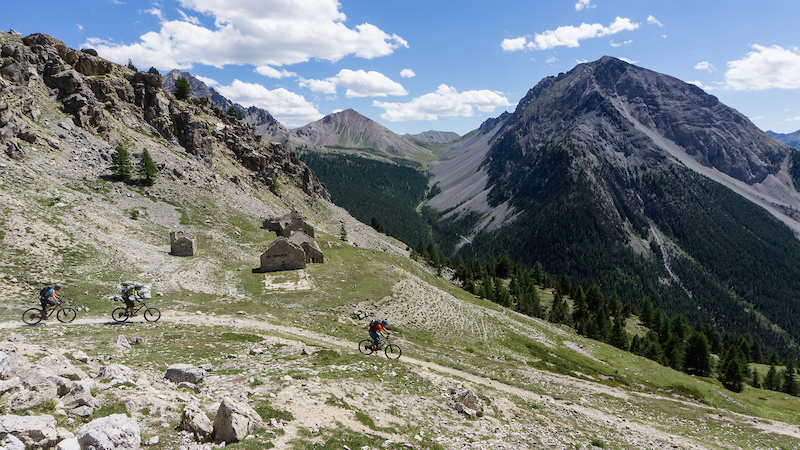 For me, this is the stand out trail of the three valleys, a little off the beaten track and some effort to get to but a cracker. A great start to the holiday and back in time for beers before dinner. 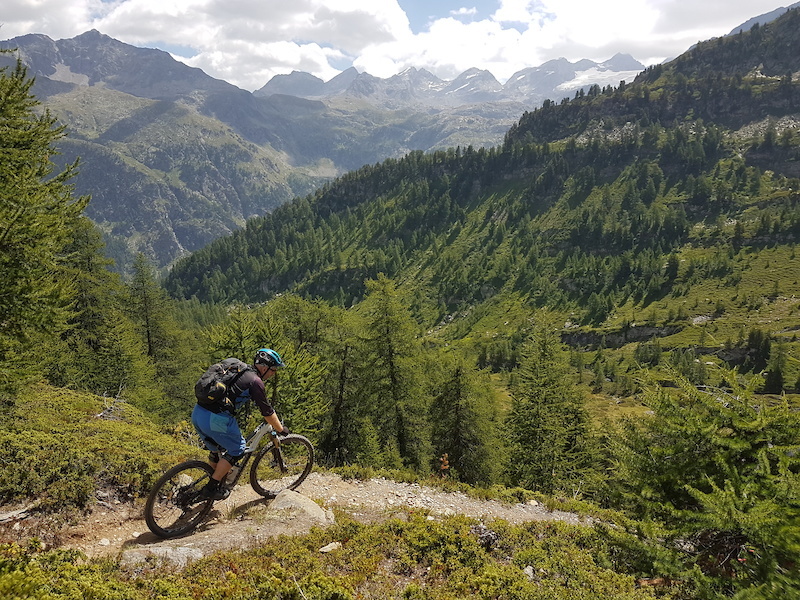 Adey fancied a bit of a drive up Petite St. Bernards and over to La Thuile to have a look at what the EWS tracks had to offer. 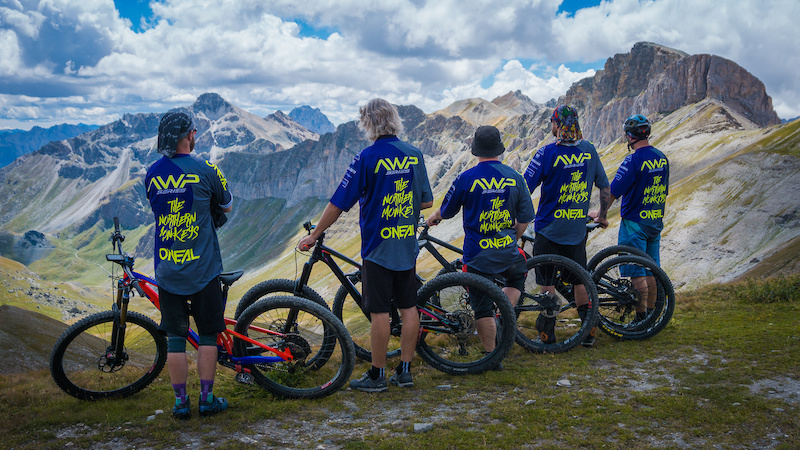 We had heard that the La Thuile EWS was the best ever and were keen to try them out. The first trail of the day was a stunner, one of those trails that said "Go Faster" then tried to kill you. 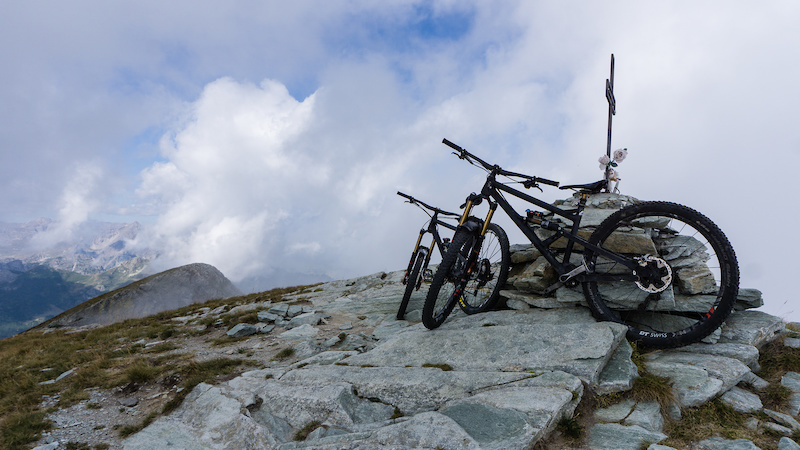 We had a spot of lunch then headed back up for some of the Bike park stuff and a couple more of the EWS trails. I can imagine when they were new they would have been incredible but a few thousand bikes have taken their toll and they are looking a bit battered now. Good fun none the less and I can imagine the spec sheet for EWS runs would read "Make it steep, and technical"
Doesn't look much, except for the exposure to the left! This was our first transfer day on the road trip and we drove to Bardonecchia in Italy, where we left the van for Keith to pick up, had a coffee, grabbed the 300m lift, and started what was to be the hardest day for me. 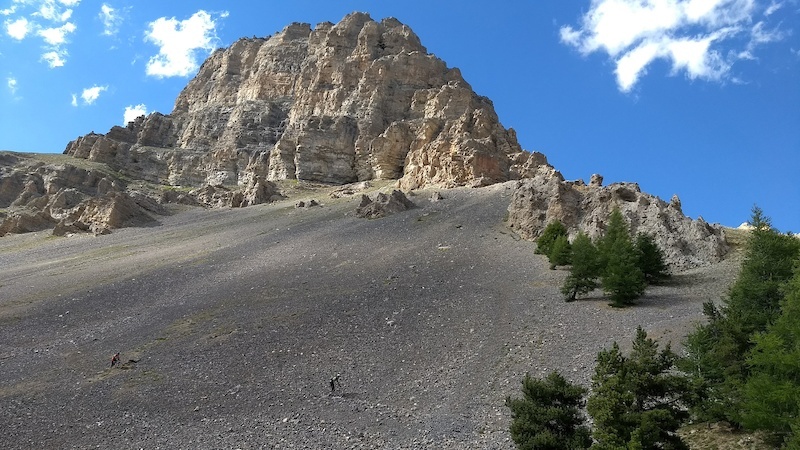 The first climb was 900 meters in ever increasing heat, a 600m descent then left us with another 600m climb straight up the other side of the valley, 90 percent carry/push... Brutal. Good place for a break. You can see the second climb in the back ground. The start of the 1,100 meters down. 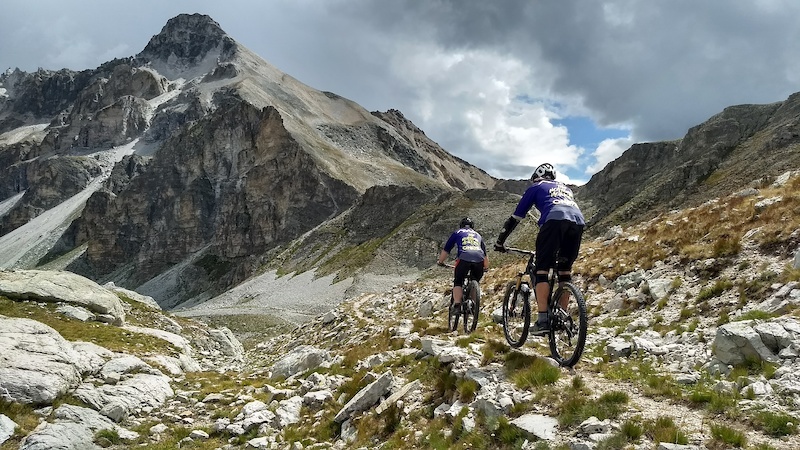 Roughly speaking the route was: Bardonecchia (1,200m) to Passo della Mulattiera (2,412m) down to Ravin de l'Open (1,850m) up to Col de Dourmillouse (2,445m) then down across the scree of Grand Peirron, through the woods to finish at Val-des-Pres (1,338m). You can see it on Google Maps if you care to look. 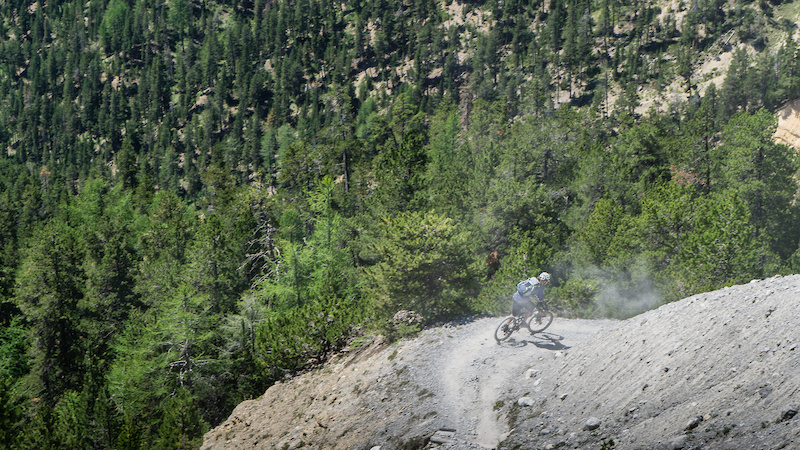 This for me was one of the best descents I have ever done, very much not for the faint hearted and the penalties for crashing would be serious, very steep off camber terrain with more switchbacks than you could shake a stick at. The heat was soon forgotten and 1,100 meters later we arrived at the bottom and at a fountain, best water ever! 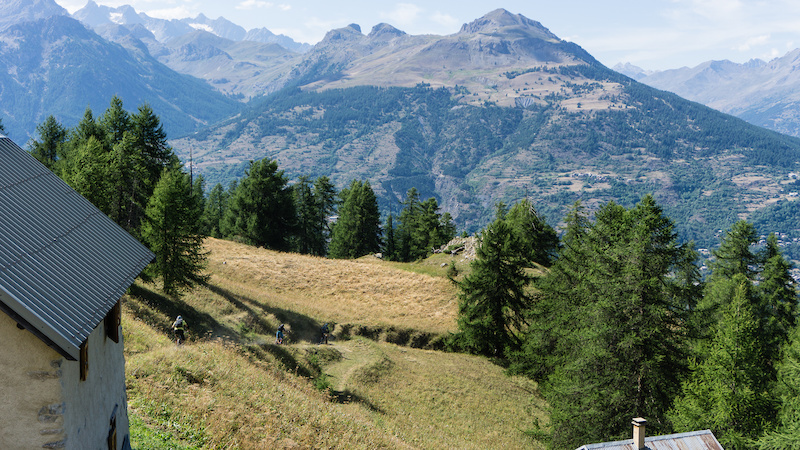 A steady roll down the road to Briancon for beer and Pizza. 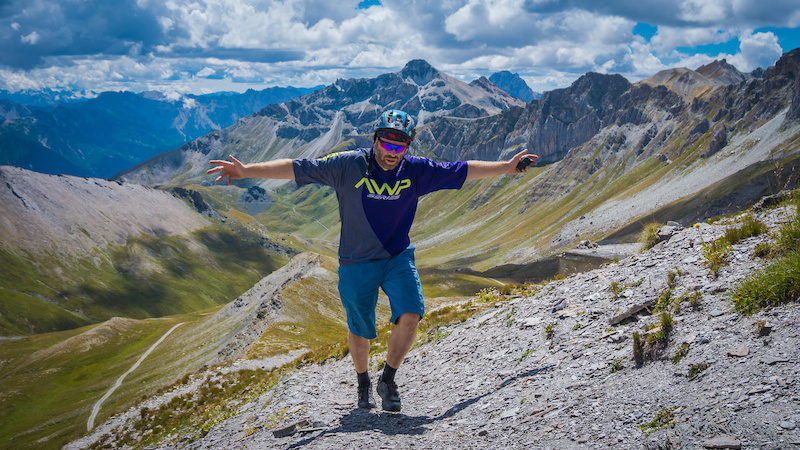 Keith joined us after picking the van up the day before, rather unsurprisingly no-one seemed in too much of a rush and it was 12 o'clock before anyone got their act together when we drifted down to the lift to see what Briancon Bike Park had to offer... Don't do it! It's quiet, very quiet and for good reason. Later in the week, Jo asked me if I could do one day again which would it be? The answer: this day and I wouldn't go to the Bike Park! To be fair we did find a black run that was fun but generally we all felt that style of riding wasn't for us. 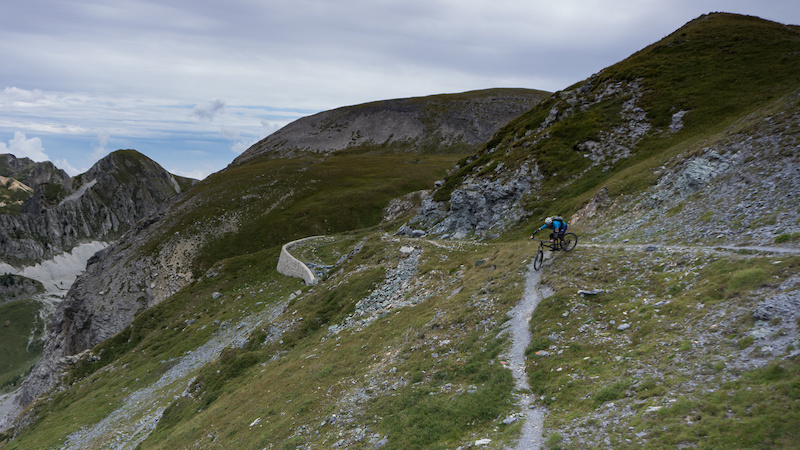 After the rather disappointing bike park, we looked to do one of the more classic Nevache routes just up the valley from Briancon. 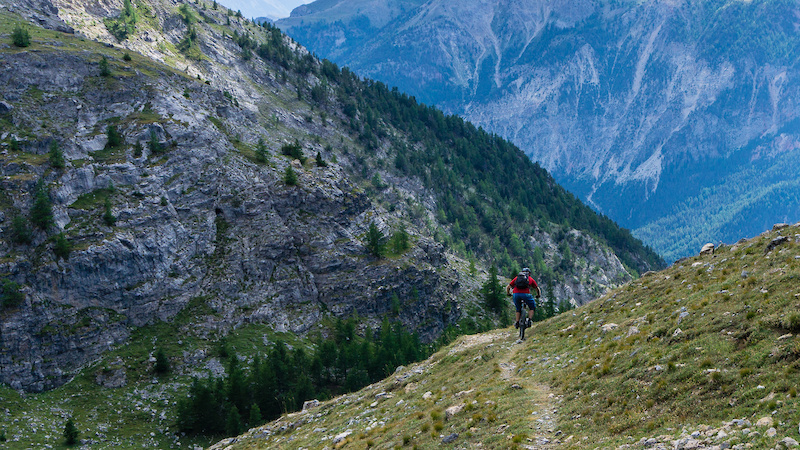 This was more like it, beautiful scenery, great riding, and no lifts. 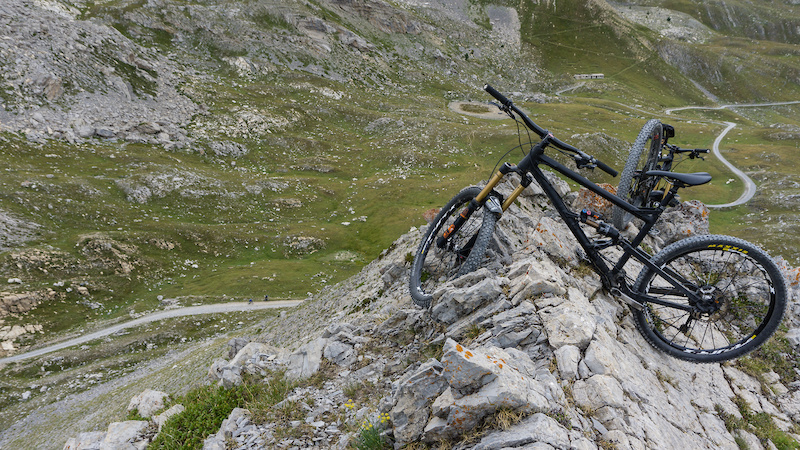 Definitely what the doctor ordered and yesterdays Bike Park was soon forgotten. 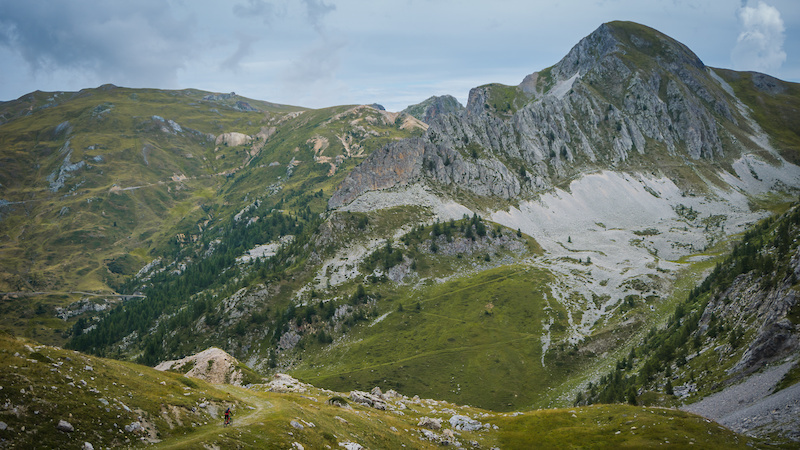 Although rather busy with walkers there was no hassle and the top of the carry soon appeared at a beautiful lake surrounded by stunning mountains, Col des Thures (2,194m) was the high point and give or take 100 meters downhill from here to the valley bottom. 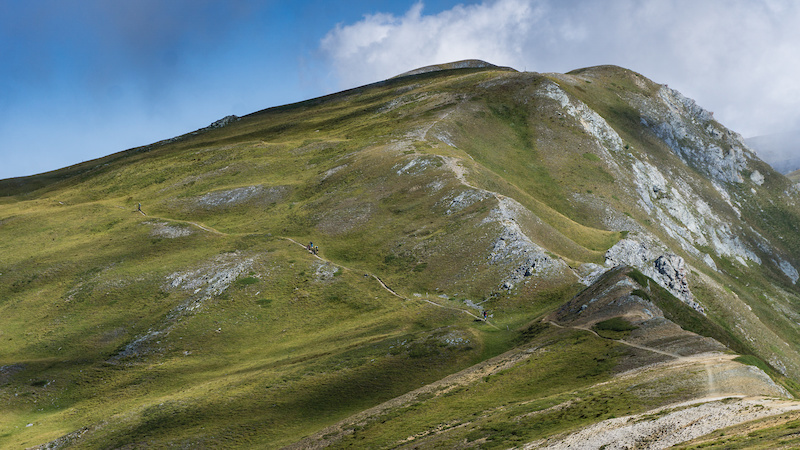 Another stunning trail going from open countryside to wooded singletrack to scree switchbacks. 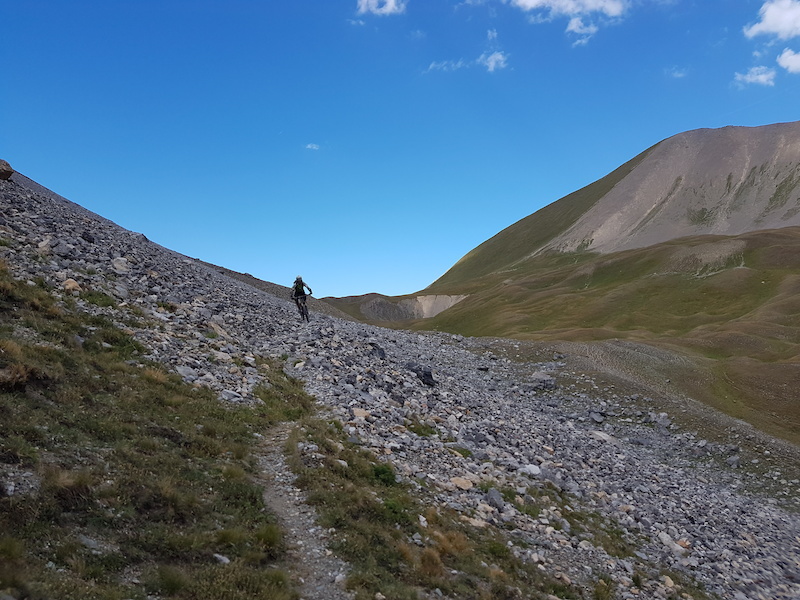 The previous day some of the guys had spoken with an English guide who told of us the best trail in Briancon... down from Le Mélezin back to Briancon. After a rather bumpy drive up we found the top of the trail and the first half was fast, loose, and steep switchbacks. Sadly either we lost the trail or it simply ended and as much as it was a good trail to come down, for me, it was somewhat overshadowed by the beauty of the morning. 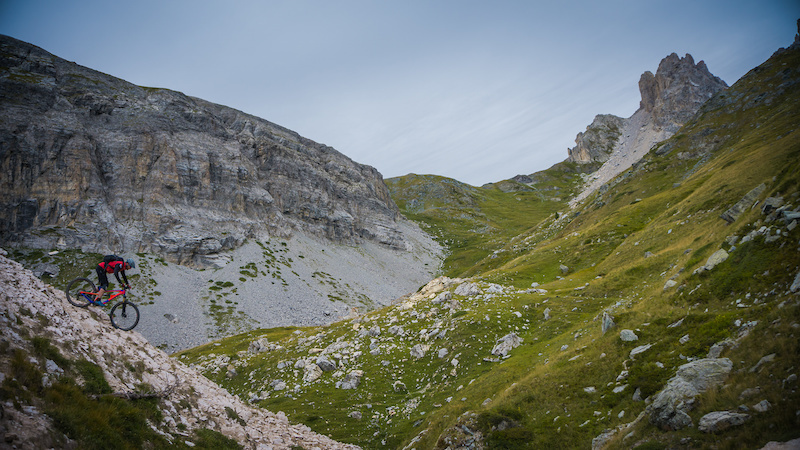 The original plan was to drive to the Queyras Mountains, do an exploratory loop there and continue on to Valle Maira. It rained! As it turned out this would have been too much to do in the day anyway so we scapped the Queyras Mountain ride in favour of a delicious lunch at a little restaurant in a beautiful village somewhere in the mountains, sadly I can't remember the name of the restaurant or the village. 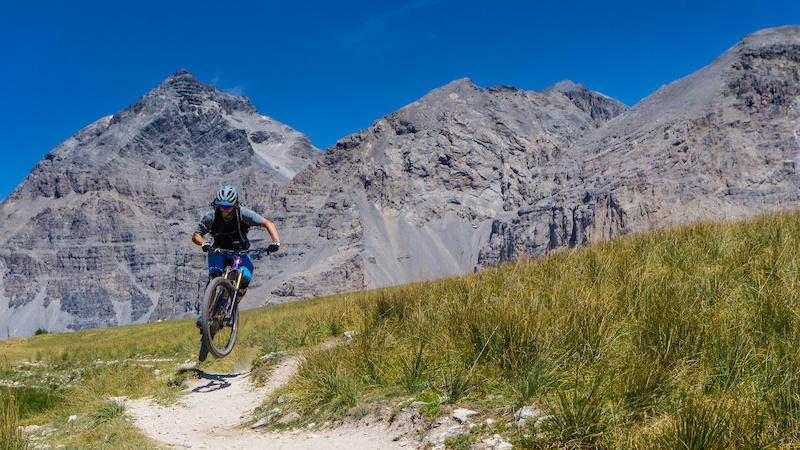 Without riding it was still late afternoon when we arrived at the Valle Maira and Pensione Ceaglio which would be our home for the next four days—a stunning place I would recommend to everyone. Dinner here was at 7.30pm and consisted of six courses of delicious Italian fare. 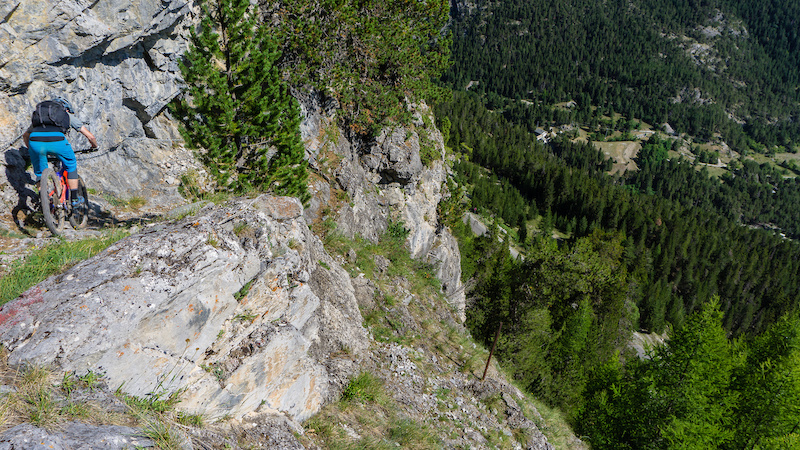 It gets boring—another stunning, steep, and technical trail followed, no-one to be seen anywhere, just us monkeys. It wasn't for free though and we hit the cloud base, lost the trail (happily not a downhill one, more a rising traverse) and spent an hour up and down and across before we found the top we were looking for and a trail. Happy days—not! 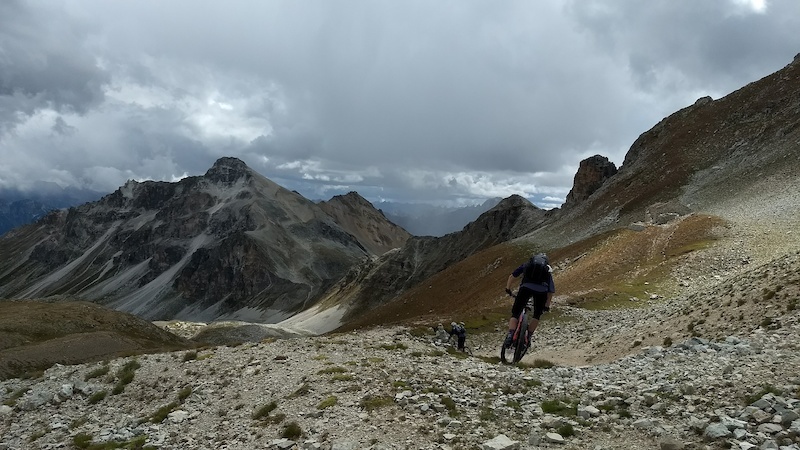 We missed a turn off and after a stunning effort of making the map fit where you think you are, two false starts, and two unnecessary climbs, we were back on it. As we set off downwards I heard Jason shout "It's a bit eerie in the clouds!" "And it gets steep!" I replied. Understatement of the week. What followed was the steepest line I have ever ridden. I actually didn't know what to do, I couldn't stop, I couldn't get off all I could do was keep pushing the front wheel at the corners and hope it didn't get worse. It did! A brief flatter bit led to a step and ropes! 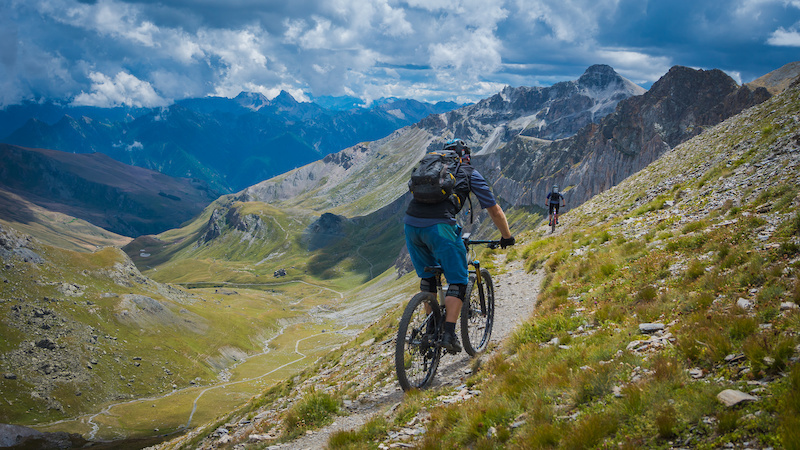 Thankfully the step let us stop and it is the only time I have ever thought ropes made a mountain bike ride safer. Soon enough we were back on, I could hear the whoops from behind and we were back in the game. The steepest, leaf filled toboggan run ever. Mint. 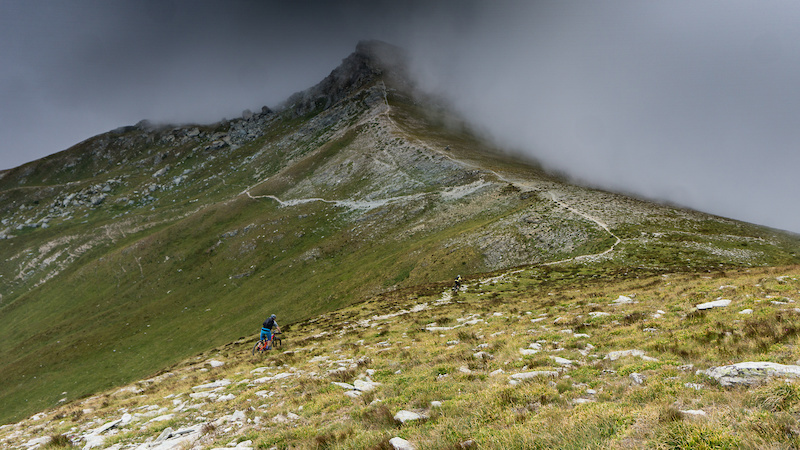 A traverse on a mint trail led us back to the Pensione in time for beer and medals. 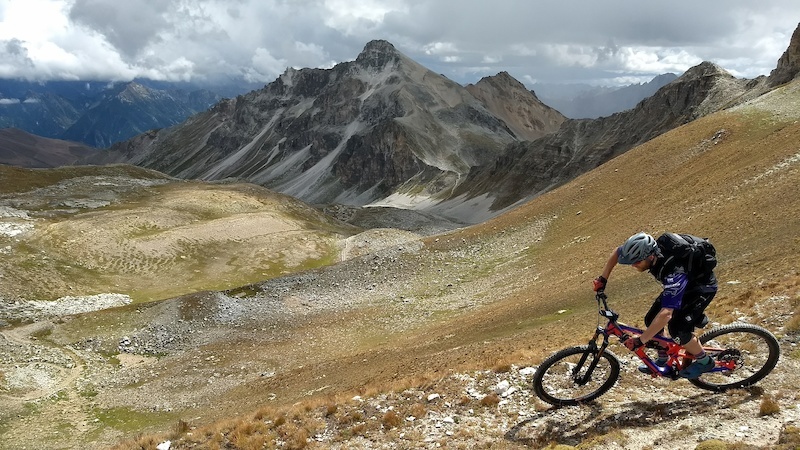 Fantastic day in the mountains, 2,200 meters of descending! After another off-piste climb and a telling off by the guys (apparently it was cold, but we weren't!) 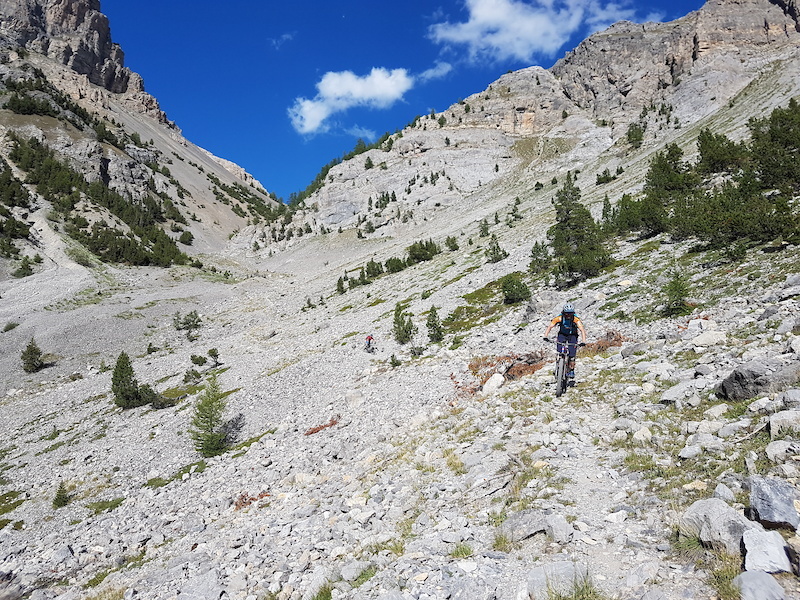 we found the descent back to the Pensione. This was a crisscrossing walkers path following the road down and was a hoot. 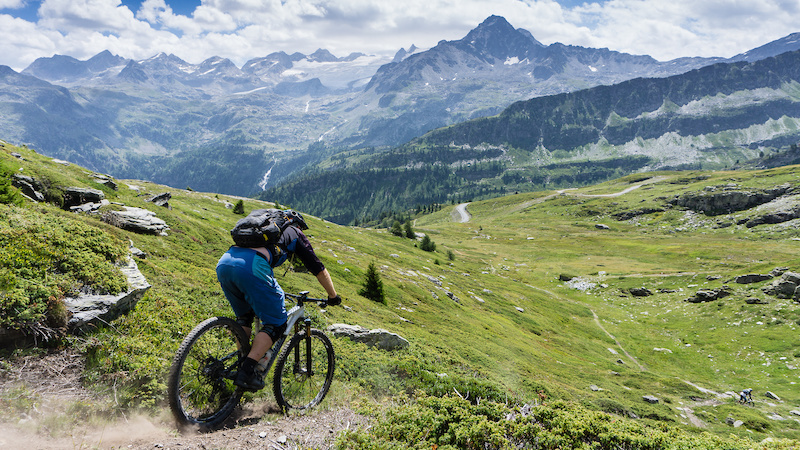 More like the trails you have at home than a mountain descent but pretty technical and a great way back home. The best way to end a trip? With a monster! Garmin said 1,260m up for 0m down at the top of the first climb to something around 2,800m at the Col next to M.Bollino. After a butty we were to take a detour from the usual route here with a massive traverse/carry/climb around the mountain side to Colle Rui taking in a little climb to the high point of the day at 2,915 meters. I can't tell you where exactly, Google Maps shows the area covered in snow and I can't find it! 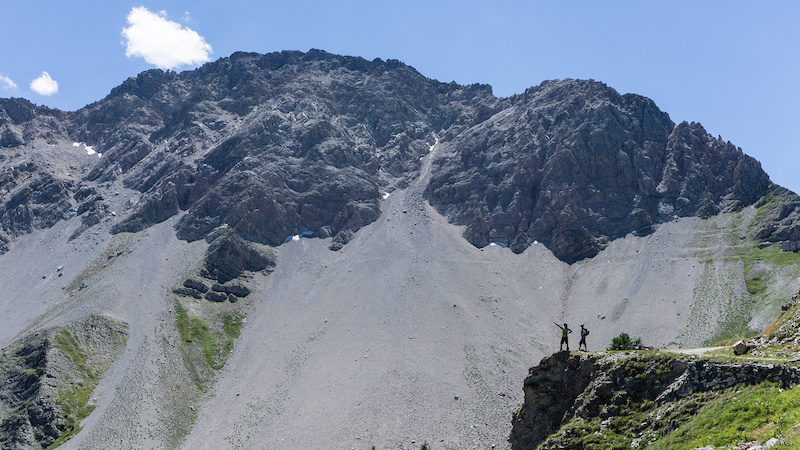 The start of the traverse. Job Done. Home. A leisurely drive over the mountains to Isola and back to Nice for the plane home. Cheers to: Jason, Dave, Adrian, Jo and Keith for the company. Thanks Fred, we stopped by chance, it was full and the lady ran after us to say they had a cancellation. Beautiful place. what a great trip! nice to see some unusual spots, took some planning! Fantastic read, some great inspiration there. Thanks! Nice one T looks better than holcombe hill!